In a large mixing bowl combine the flour, sugar minus on teaspoon, and salt. Mix well. In another bowl combine the water, yeast, and remaining sugar. Let mixture sit for 10 minutes then stir until yeast is dissolved. Add vegetable oil to the yeast mixture and stir. Add half of the yeast mixture to the bowl of flour and mix with hands, then add in remaining yeast mixture until flour is fully incorporated. If your dough is dry add 1 tablespoon of warm water at a time until it is moist. Turn dough out onto a lightly floured surface and knead for about 15 minutes or until dough is smooth. Place the dough in a greased bowl, cover with a towel and allow the dough to rise for about 1 hour. This should make it double it's size. Punch down dough then add in cheddar cubes and jalapenos by mixing with your hands. Divide dough into two equal portions. Form into loaves and place in temp-tations mini loaf pans. 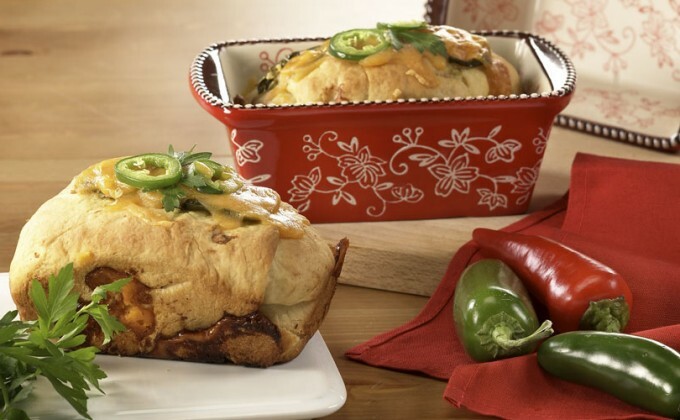 If desired, add jalapenos or cheddar to tops of loaves for extra flavor. Cover mini loaf pans with a towel and allow to rise for another 45 minutes. Bake at 325 degrees for 30 minutes until tops are brown. Allow to cool for a full hour and a half before slicing.